IMAGE: Konkona Sensharma and Neeraj Kabi in a scene from Talvar. Rashomon, one of the ruined ancient castle gates of Kyoto, Japan, is the setting against which the accounts of a murder are exchanged between two bystanders. The witnesses are subsequently summoned to relate their side of the story in court. Their versions -- along with the defence of the accused and the account of the survivor -- become the four contradictory, self-interested, testimonies of a grim event and the plot of a famous 1950 Japanese movie. Producer-director Vishal Bhardwaj, who has a passion for dabbling and Indianising the plotlines of Shakespearean classics, moves Rashomon from Kyoto to Noida, in his latest film. He uses the cinematic device of Akira Kurosawa's masterpiece -- Rashomon-style multiple viewing glasses -- to examine the unfortunate 2008 Aarushi Talwar-Hemraj Banjade double murder through several conflicting pairs of eyes. Talvar -- the film's title is an interesting play on a surname -- has no larger-than-life heroes. Instead, the protagonists in the film are the three investigations into the murders. Why did Talvar, which ironically released on Gandhi Jayanti, come about? Director Meghna Gulzar (Filhal, Just Married, Dus Kahaniyaan) was hunting around for her next film project. The notion of focusing a film on the much-talked about Noida case came out of a conversation, she says, she had with family friend and her father lyricist-director Gulzar's protege, Vishal Bhardwaj. "Do you want to do something based on literature? Something fictional? Non-fictional? Real life? That case? This case? Yes this case. It was like that," Meghna Gulzar tells Vaihayasi Pande Daniel/Rediff.com in an interview that unfolds in a bagel shop, near her Pali Hill, northwest Mumbai, home, hours before she flew to Toronto to screen Talvar at the Toronto International Film Festival. "The idea came from him (Bharadwaj)," she adds. He is a far more gritty filmmaker than I am. Our films are in very different spaces and universes. I made largely urban, contemporary upper class character films. His were mostly gritty, rural, badlands-of-India films. Therefore his thinking is bent in that way. His bent of mind, while thinking of what space to put a film in, and my leaning towards (making) a film that has some kind of relevancy in a film -- that conversation -- made us both arrive at this." It was not an easy project to settle for. Writing a script for a movie based on a controversial double homicide case that had an excess of superficial details, but not enough of the more important details, like who committed the murders, is complex. What followed next for Meghna Gulzar was nearly two years of research, even as the Noida case was winding up in court after 16 months; the 204-page verdict was delivered in November 2013. "The case was six years old when we started," the director remembers. "We had to start from the beginning. It was not about what was being reported while the trial was going on. When you go that far back, you can't just go by the first piece of information that Google throws up at you. You have to keep modifying your key words and keep searching, sometimes by date, sometimes by key word, sometimes by publication, so that you get every possible piece of information digitally available on that particular topic." "Plus, I also have an OCD (Obsessive Compulsive Disorder) tendency." She laughs. Her two years of exhaustive research is apparent as the conversation proceeds. She recalls names, details, incorrect reports that she had checked up on, with ease. "It was important to get everything that was there, to have an informed opinion before you go into writing. That's why it took that long. Also because being in the real space -- when there are conflicting theories, conflicting opinions on it -- you have to be that much more careful. If it was a simple open and shut thing, with no debate over it, no varying theories, it would have been much easier. It would have been a simple, straight, cut-to-cut process which it was not." Why did she think she was equipped to take on making the screen version of such a difficult and tragic case? She takes no umbrage at that question, although she does at other questions later. "I didn't," she confesses grimly. And repeats that, half almost to herself. "I didn't." "I still wonder how I went through that shoot. I had blinkers on (as if) this is all I have to do. Nothing else mattered. Also, I was coming back to making films after a very long time (Dus Kahaniyaan was made in 2007). A lot had changed in terms of cinema, audience, technology, the metaphor, the language used, all of that -- I wouldn't call it insecurity -- but the unfamiliarity drove me, even more, to be sure of what I am doing." While trying to make sense of the mostly sensational reportage of the Noida double murders, after the news broke -- and before she decided to make a film on it -- she recalls she found herself facing the same flip-flop the public went through, as the police theories changed rapidly and bounced in every direction. 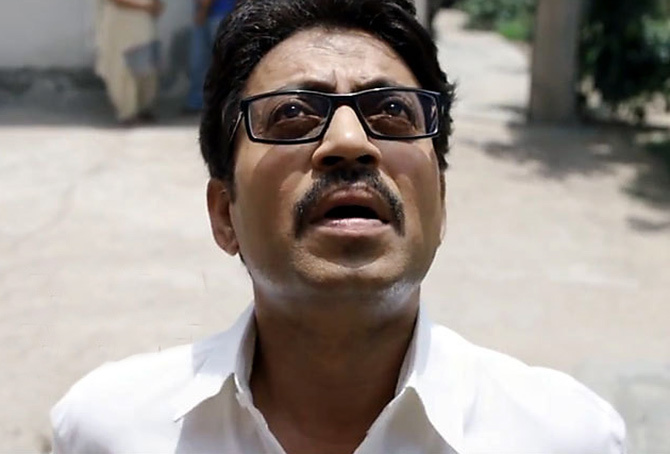 IMAGE: Irrfan Khan, who plays the CBI investigator in Talvar. "I went through the same trajectory. When it was only the servant, who had run away after the killing, I believed it. When the servant was found and the father was blamed, I believed it. When another theory started coming across, I believed it. That's how it was presented; very convincingly in the media. Unfortunately the parts that gave a counter argument to the establishment (view) appeared on page 5 and page 7 of the newspaper -- not on the front page." When she set out to do the research for the film -- research that Vishal Bhardwaj relied heavily on to write the script -- she resolved to do it differently. "I am vocal about both sides. That's what the film is doing -- presenting both sides." "The fragility of this case is that taking a side could be a fallacy to do. Because you don't have all the answers. So how do you take one particular side?" she asks. "Especially as a filmmaker -- even though I might have my own personal beliefs and opinions about the case -- I will not profess that in my film. I want my viewer to come to that conclusion," she adds. "For us, the best approach was to lay out all the facts, both sides, and let the viewer decide which one they want to lean towards..."
"While doing the research, a lot of facts, which kind of connect the dots, come forward. Then you start questioning this theory. And that theory also. You do. You do start questioning that." Talvar, Meghna Gulzar explains -- in a hat tip to Rashomon -- looks at all three investigations that occurred around this double murder case -- the two Central Bureau of Investigation probes (the first begun under then CBI joint director Arun Kumar in May 2008, the second begun under then additional CBI supreintendent of police A G L Kaul in September 2009) and the initial Noida police enquiry after the murder. "If the investigation is the hero, then all three investigations are the hero. But I will put it differently: I will say the investigation of this case is the anchor of this film, the driving force of this film. All investigations. By each team. And the actors are just the vehicles, who play the characters (who are part of) the investigation." During the course of their lengthy research, the director and her team did not try to meet the Talwars, who were in and out of Dasna Jail, Uttar Pradesh, at the time, as the CBI investigation proceeded, until they were lodged there permanently after the Ghaziabad court verdict in late 2013. Meghna Gulzar did not feel the need to get inputs from the Talwars. Or take their permission to shoot a movie on their 14-year-old daughter's murder. "Because we got enough information. Our research was already done. Our timeline was already done. We knew we did not want to be anybody's propaganda vehicle," the director says, adding, "So for us it was just about corroborating, just making sure that we are not completely off, on either trajectory." The information for the Talwars' side of story -- checking the timeline and cross-checking various facts of the case -- came from a single meeting with Dr Rajesh Talwar's brother and sister-in-law, eye surgeon Dr Dinesh Talwar and his wife Vandana, after which she said they did not feel the need to meet the Talwars. "Because they (Dr Dinesh and Vandana Talwar) stand for everything that Rajesh and Nupur Talwar cannot be present for physically themselves. So they do everything -- whether it is their Web site, whether it is fighting the court case, whether it is appeals, whether it is stay orders, they are the ones running the show. It was them that we met in the course of research." She gets a tad irritated when asked why the filmmakers did not seek the Talwars' permission to make the film. "I just finished saying that I met all connected parties for the research. Vishalji has very, very categorically announced at his press conference that no permission was taken. Because it is not any one person's story, a propaganda story." "It is a film on the investigations that went on in the case. It is not taking sides," she insists. "Neither nor or against. My content is completely, freely, available in the public domain." Unearthing and collating reams of facts, carefully easing them into the right order and nailing the timeline down was not the greatest challenge of making Talvar. Daunting too should have been handling the narrative with a special degree of delicate sensitivity or as lead actor Irrfan Khan told Rediff.com: "Because this is such a sensitive case you cannot really take liberties." Meghna Gulzar does not feel so. Mainly because she was very firm about the kind of film she was making. "It is very easy for a film like this to become voyeuristic," she says, "To become sensational and lose its authenticity and dignity completely. We were very aware that was not the kind of film we wanted to make." Building that sensitivity into the filming process, she says, came on its own because "I think of the familiarity with the content because of my research. Also from sitting with Vishalji on the script. He would do a sequence and then bounce it off. The content was very familiar to me." "When you are sure of your content, the execution becomes easy. The script itself was rock solid and very, very, clear and detailed. And that is a director's biggest asset." "The only challenge was maintaining a clinical objectivity while making the film. That was a subconscious process which was constantly on. It would be tiring and one would get more tired mentally because of that fatigue at the end of the day rather than because of the physical duress of the film shoot." Perhaps it was emotionally tiring too, taking one through a catharsis of sorts. "It would come back to me from time to time. Something would happen. When we were in Haridwar we came across the pandit who had actually done the... Then it hits you. This is real. These are not characters. This is real." What does Talvar hope to achieve? What is Meghna Gulzar striving for? Does it simply hope to counter the sensational media coverage? "This film is a very neutral take. I am not countering the media, I am not countering the cops, I am not countering the judiciary. I am showing both sides." Countering misinformation then? "Well, yes, misinformation also. And (pulling together) all the information that has been disseminated over eight years and putting it in perspective... Some of it was true. Some of it was fed by the investigating agencies. This happened with both the investigations. Even with the police and even with the CBI." "Even with the first breakthrough when they announced that it is not the father, it is the servants. But what did they have to corroborate it? This over enthusiasm is there in our investigative agencies. And the media falls for it. You can't entirely blame the media... (In reference to the partner swapping theories alleged against the Talwars) these were canards set loose by the Noida police." "I think the CBI is much more wiser than to fall for that. But they must have had their reasons why they looked back to the same honour killing theory, which were far more credible than wife swapping." The purpose of collecting all this information in a film? She counters that with a question of her own: "Does the entire population believe that the verdict was a fair one? Hands down? If that was the case Avirook's book (Aarushi by journalist Avirook Sen) would not have got the reception it did. Therefore, it is unfinished." "The entire population, or the society that this case happened in, and these people belong to, do not all, in complete majority, believe that they are guilty and that justice has been served. That's why it is unfinished. That's why there is no closure." While crafting Talvar, Meghna Gulzar explains that she made every effort to make sure her views did not colour the narrative. Nor will she reveal her personal take on the case because she doesn't want people coming to see Talvar with knowledge of her personal opinions because that would be unfair to the film. Much time has been invested in making sure the film does not reflect personal views, neither hers, or anyone else's. "I am not here to push a particular point of view. The intent of this film is not to spotlight one particular aspect of the story. It is about raising those questions, why are they unanswered, trying to connect the dots and seeing whether we can finally get a clear picture." She knows that the audiences, who will come trooping in to see Talvar in cinema halls across India, will arrive encumbered, weighed down by personal views, prejudices, and "preconceived notions." In fact, she is counting on it. So maybe Talvar has the strength to dislodge earlier views. And open minds. "It is about at least making them aware... The case is eight years old. Information has come in bits and pieces. A lot has been underplayed. A lot has been overplayed. Not necessarily fairly. So it is important that everything is presented with neutrality. Only then can it be effectively evaluated by an audience." 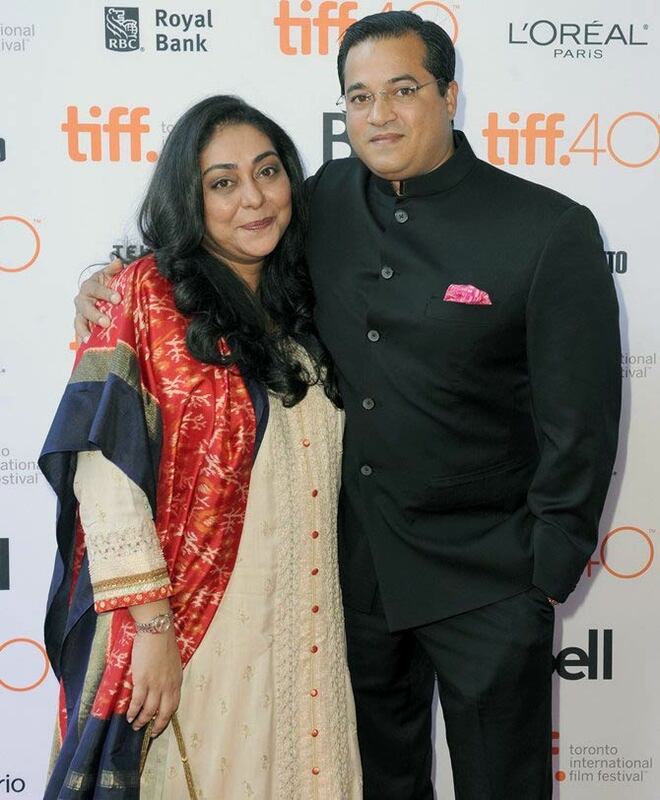 IMAGE: Director Meghna Gulzar with her husband Govind Singh at the screening of Talvar at the Toronto International Film Festival. In a recent newspaper interview, Gulzar, Meghna's legendary father, praised Singh for supporting his wife through the making of the film, looking after their young son among other things during the rigorous filmmaking process. 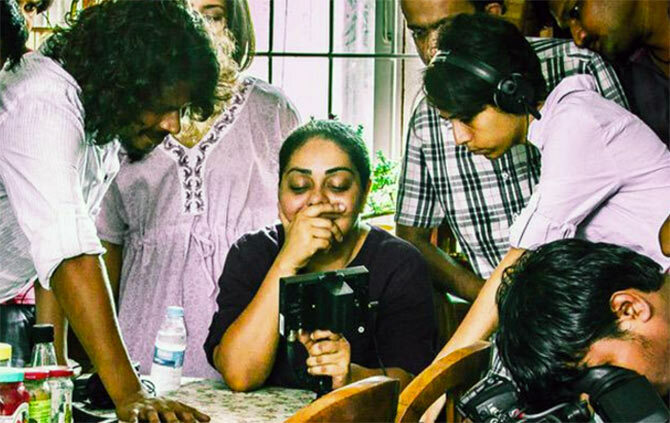 While the sheer stress of working on a real life story is huge, it is a project Meghna Gulzar would like to come back to. "Most definitely. Most definitely." "There is a challenge. There is a relevance to the film. It makes it that much more richer. I am not saying every real life film has to be a story about crime, death and scandal. But what better strength to give to a film than when it actually reflects a society, and manages to capture milestones in history of that society," she says. "I don't think there is a bigger strength than that." At a press conference last month, a room full of journalists, drawing parallels between murder cases, asked the director if her next project would be a film on the Sheena Bora case. Her answer was sharply in the negative. "It is too soon. Too soon. If I had asked myself this in 2008 (about the Aarushi-Hemraj case) I would have said the same thing. The (Sheena Bora muder case) case itself hasn't had time to play out. The investigation is not over. We do not know whether there is going to be any penal action against the people involved. It is too nascent to talk about making a film on it right now. It is too nascent..."
Any particular moment in Talvar that is very important to Meghna Gulzar? "There is a 13 page scene, which translates into 13 minutes of film time, which is a masterstroke in writing by Vishalji. For me that is the fulcrum of the story."